Sean Swarner was born on 2 September 1974, Ohio, United States. Swarner was one of the top most inspiring people all time. Very less people were able to reach Mount Everest and very fewer people have climbed all the seven summits. No one else is known to have overcome the twin deadly hurdles of surviving twice from the clutches of cancer and finishing the no-less easy task of reaching the highest summit in the world. Sean Swarner is the first cancer survivor to summit Mount Everest and is still seriously carrying on his mission to reach the summits in other continents as well. He has since topped the highest peaks in Africa, Europe, South America, Australia, Antarctica, and North America, thus completing the “7-Summits”. Sean Swarner graduated from Willard High School in Willard, Ohio in 1993 and Westminster College in 1997. At age 13, Swarner was diagnosed with the 4th stage of Hodgkin's disease, when doctors had revealed he had only three months to live. After a long struggle, Sean beat the odds and the disease was in a stage of remission by the time he was 15. When he was in 16, he was attacked by a completely different form of cancer. Askin's Sarcoma, a deadly tumor attacking only 3 out of a million people. An Askin's disease tumor grew on his lung and proliferated to the size of a golf ball. After removing it, doctors said that he had two more weeks to live. Approximately for a year and half, he was in coma and after subsequent bouts of chemotherapy and even radiation therapy, he won his league track meet in the 800-meter dash. Swarner realized that after defeating cancer twice, no challenge would ever be too great, no peak too high. 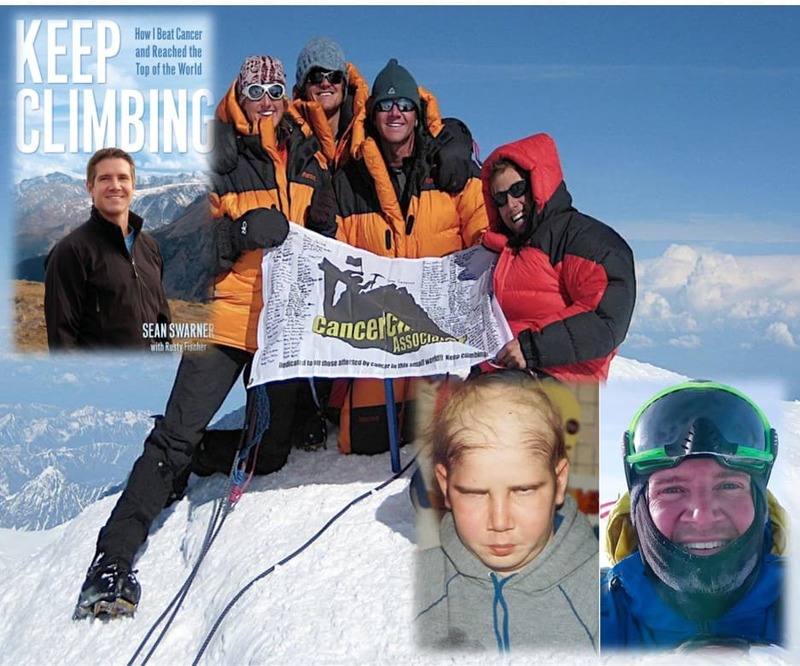 Sean Swarner established his own foundation “The Cancer Climber Association” which promotes cancer awareness and helps raise money for cancer research. Sean Swarner also authored a book titled Keep Climbing. Sean Swarner was also a motivational speaker to corporations, universities, and other organizations around the globe. He shares his message of healing, hope & triumph with cancer patients worldwide. On 2002, with only partial use of his lungs, he became the first cancer survivor to summit Mount Everest. 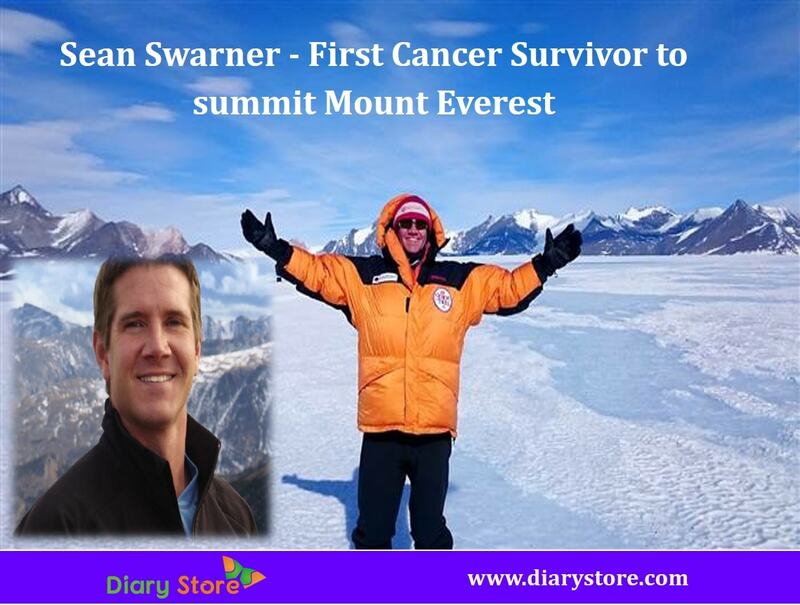 Swarner has since conquered highest peaks in Africa, Europe, South America, Antarctica, Australia, and North America (Kilimanjaro, Elbrus, Aconcagua, Vinson Massif, Kosciusko, and Denali/Mt. McKinley). On October 11, 2008, Sean completed the Ford Ironman World Championship in Kailua-Kona, Hawaii. You can go a month without food, you can live three days without water, but you can't go more than sixty seconds without HOPE. If you want to do something and you have a goal, do it, don't wait, because your channel might change sometime soon - and quite unexpectedly. I realized at a very young age that health is precious, and too many people don't realize it until it's slipping away, or worse yet, it's gone. If you want to feel rich then remove everything you have that money can’t buy and see what you have left. Then you will truly feel rich in life. Before I even begin on any journey, I picture the end result and make it real in my mind’s eye, and if any obstacles get in my path, they will only slow me down…Never stop or prevent me from achieving my goals. In my head I’M already there and anything that gets in my way is never enough to deter me from the emotions of already accomplishing my goals. It’s very important to do something that works for you, something that’s unique to yours personal style of success. However, during the journey to your goals, always remember that you do not have to be the best… but be your best.